Traditional gas chromatography is a well known and very widely used method for chemical detection and analysis installed in hundred thousands of laboratories world wide. Basically, the heart of the chromatograph is a column, a long tube that separates the various substances by mainly due to their individual boiling points. The separation characteristics depends also upon the chemical nature of the inside surface layer of the column. 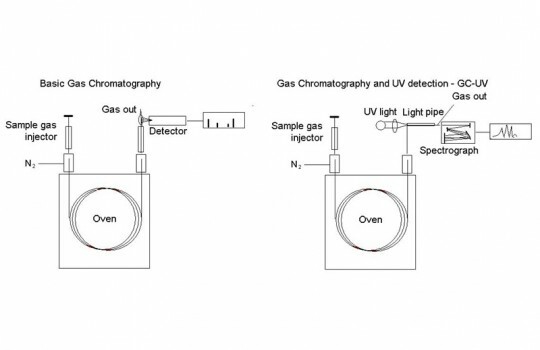 The flow of gasses can be detected by various means and a basic gas chromatograph can have various detectors to detect the variations in the out flowing gas. The basic ones are concepts like flame ionisation detectors and time from injection of the mixture of substances to when they appear by the detector in the end of the column can be, for simple cases, the indicator of what substances it is, given that temperature and pressure is kept under control. There can be detectors like MS Mass Spectroscopy that actually disassembles the gas molecules and measure their mass, often by observing variations in their travel in a very low vacuum system GC-UV does not have to take into such strict consideration of time of elution, temperatures or pressures due to that is the spectral absorption of light that determines the substances. GC-UV is based on the UV light absorption in the gas/vapour phase as the detector. The wavelength range is extended down into the far-/vacuum-UV. This gives a number of advantages. By carrying out the recording in the vapour phase no spectral shifts, like in the liquid phase, are present and, there are no cut off wavelength limit due to any liquid solvent. At the short UV-wavelength range the majority of the qualitative information can be gained. Moreover, this range also most often shows the highest absorptivities (i. e. highest sensitivities) and many classes of chemical compounds, not considered as UV-absorbing, can be determined with high sensitivity. The GC-UV is a general method of analysis and can be applied within numerous application areas. The results obtained are both qualitative and quantitative. The qualitative results give both identification of individual compounds, including isomers and chemical classification of compounds present in the sample. Classification gives comprehensive information about the chemical class as for example an aliphatic ketone or a substituted benzothiazol and so on. Quantitative determination is based on the knowledge of the light absorbing power of the compound and is often carried out using standards with known concentrations. This is the principle (Lambert Beers law) of spectrophotometry and is considered to be one of the most reliable quantification principle.